Are you confused by GDPR, and how it will impact your WordPress site? 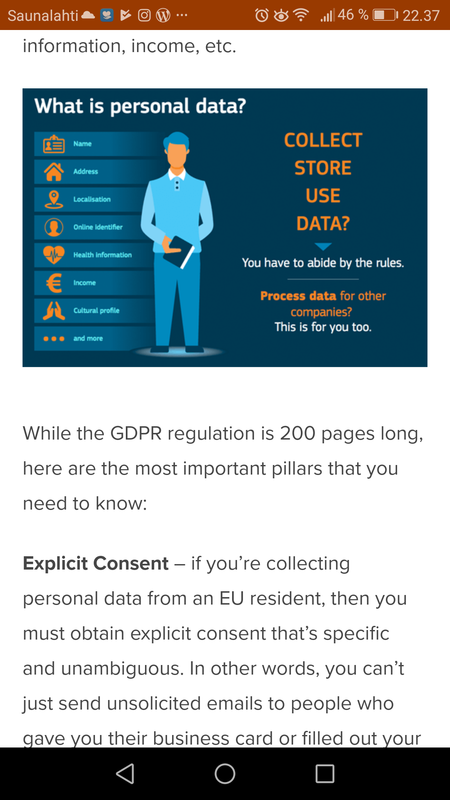 This article tries to explain everything you need to know about GDPR and WordPress (without the complex legal stuff). The EU isn’t some evil government that is out to get you. Their goal is to protect consumers. Is my site 100% GDPR compliant after installing the plugin? No. At this point it is impossible to say what makes a site 100% compliant with GDPR or not because the regulation is not specific on (technical) solutions. With future updates we’ll expand the plugin to include more features helping you take care of as many parts of GDPR as possible. With the WP GDPR Compliance plugin it is possible to automatically add a GDPR checkbox to Contact Form 7, Gravity Forms, WooCommerce and WordPress Comments. By ticking this checkbox your visitors and customers explicitly allow you to handle their personal data for a defined purpose (i.e. taking care of their order). Thank you for spending time and explaining the innovation in an accessible language. Honestly, I was in the purity of those who were scared for their personal data. As a business owner and a website on WordPress, I still have questions. But I am grateful to you for the guide. Much obliged to you for investing energy and clarifying the development in an available dialect. Truly, I was in the virtue of the individuals who were terrified for their own information. As an entrepreneur and a site on WordPress, regardless I have questions. Be that as it may, I am thankful to you for the guide. Super Guide for WordPress compliance. How to ensure my site is GDPR compliant? GDPR compliant is over 200 pages. How to manage it? Thank you for sharing information on the GDPR, keep on posting new. GDPR is the latest issues and I think been great help by sharing this article. A critical security flaw affecting a GDPR compliance plugin for WordPress has been exploited in the wild to take control of vulnerable websites, users have been warned. The WordPress GDPR Compliance plugin, which has over 100,000 active installations, is designed to help the administrators of websites and online shops become compliant with the EU’s General Data Protection Regulation (GDPR). It supports plugins such as Contact Form, Gravity Forms, WordPress Comments, and WooCommerce. According to researchers in Defiant’s Wordfence team, the vulnerabilities can be exploited by unauthenticated attackers to obtain privileged access to targeted websites by adding new admin accounts. Shortly after the news broke that the GDPR Compliance flaws have been exploited in the wild, WordPress notified the developer and deactivated the plugin on its official store. The application was quickly reinstated after its creators released version 1.4.3 on November 7, which should resolve the vulnerabilities. Thank you for sharing this valuable information. My website is also on WordPress.